LUSAS has been used to investigate the safety of the Hagia Sophia mosque in Istanbul, Turkey, during an earthquake and to determine if any strengthening or repair work is required. Hagia Sophia (Aya Sofya) was once an early Greek church, built during the Byzantine period and for one period of 800 years it was the largest structure in the world. During this time it was affected by many earthquakes resulting in several reconstructions of different parts of the main dome and repair of some structural elements. The effects of previous seismic activity can be seen all over the building. 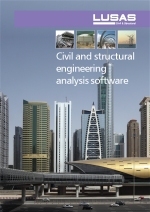 LUSAS finite element analysis to predict natural frequencies and likely areas of damage in the structure. The team decided to use LUSAS because it has excellent facilities for predicting the nonlinear transient response of structures and a wide range of high performance elements. Nonlinear material models in LUSAS are used to predict local damage and failure mechanisms in the structure. Results obtained using LUSAS indicate that damage will occur initially in the west and east semi-domes before proceeding to the arches and main dome. 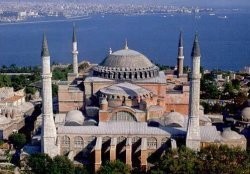 Other analyses performed using LUSAS finite element analysis include the Hagia Eirene church and Suleymaniye mosque in Istanbul.